Raising teens and parenting young adults in today’s world presents huge challenges for parents. The Mighty Parenting podcast provides solutions and strategies. 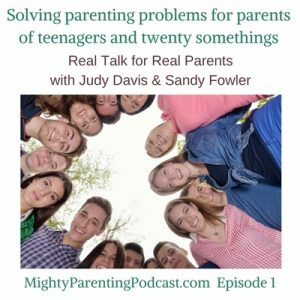 Co-hosts, Judy Davis and Sandy Fowler, interview experts, share stories, and get real, raw, and relevant as they dig in to the problems of parenting in the 21st century. A DASIUM initiative, the Mighty Parenting podcast is a weekly show for parents of teens and young adults. Designed for families looking to raise happy, successful, emotionally-healthy kids, each episode tackles the tough topics you need. Topics discussed are stress & anxiety relief, bullying, social media, peer pressure, healthy coping strategies, learning disabilities , communication, parenting strategies, and so much more. The Mighty Parenting show goes upstream to the mental and behavioral health issues affecting teens and young adults. This podcast is focused on sharing information that families, educators, and mentors can use to empower kids in an effective way. In this launch episode, Judy and Sandy spend a few minutes giving you an inside look at what the show is about. They share how it can help you in raising your teen or parenting your twentysomething. If you are ready to dive straight in, hop on over to our first full show here. Judy Davis and Sandy Fowler‘s combined experience and passion bring awareness, knowledge and action to the growing crisis of teen and young adult suicide. They continue to speak and bring programs to families through DASIUM and the Mighty Parenting Podcast. Judy Davis is a nationally recognized motivational speaker, author and entrepreneur as well as a military life and teen suicide prevention expert. Co-founder of DASIUM and CEO of TheDirectionDiva, Judy has a passion for helping families navigate the emotional side of family, business and military life. Her books Right Side Up and Warning Signs: Is Your Teen at Risk are go to resources and her websites are filled with tips, inspiration and resources for those looking for direction. Sandy Fowler is passionate about helping women de-stress their lives. Sandy coaches, writes, speaks and hosted the Heart Filled Holiday’s radio show. HFHradio show focused on weeding out stress and creating more joy. Using simple strategies and calendars as a springboard, Sandy helps women create happiness in their lives every day. She’s a wife, mom and business owner whose greatest joy, next to loving her family, is seeing the women she works with find the joy they’ve been looking for.